Located in lush, gated tropical setting alive with palms, plumeria and hibiscus. Recently remodeled TWO bedroom with all new tile floor and carpeting, decorator furnishings and all new appliances. 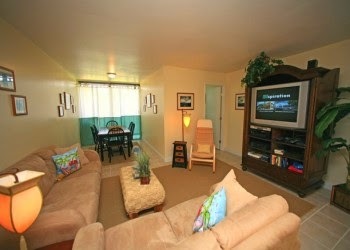 36 inch HD TV, surround sound stereo, high speed internet, Air conditioners in both bedrooms. Electric inflatable queen bed for additional guests. A 5 minute walk to The Resort at Turtle Bay where there are many attractions that are available to you, day spa, 2 golf courses, helicopter tours, horse back riding, surfing lessons, and a safe swimming and snorkeling beach. You're 10 minutes from famous surfing spots and 20 minutes from Old Town Haleiwa and the harbor. Come be our guest and enjoy 'country' paradise at its best. There are three pools and two tennis courts on the property. A five minute walk to The Resort At Turtle Bay where there is casual and fine dinning as well as outdoor beachfront restaurants. The hotel offers many attractions that are available to you. Some of which are day spa services, helicopter tours, horseback riding, surfing lessons, miles of walking trails, two 18 hole golf courses, a safe swimming and snorkeling beach. There are super markets, fast food restaurants, The Polynesian Cultural Center (the second most visited attraction on Oahu), famous big wave surfing spots like Waimea Bay, Sunset Beach, Banzai Pipeline all within a 10 minute drive. The Old Town of Haleiwa is 20 minutes away where you can enjoy some interesting shops, restaurants, and the boat harbor. If you want to swim with the sharks, you can check out the tours offered. Come be our guest and enjoy 'country' paradise at its best.